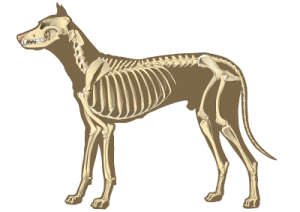 Veterinary Spinal Manipulation is a manual therapy, which can be used for many health and performance problems. It focuses on the biomechanical dysfunction of the spine and its effect on the entire nervous system throughout the body. Veterinary Spinal Manipulation Therapy does not replace traditional veterinary medicine; however, it can provide additional means of diagnosis and treatment options for spinal problems as well as biomechanical related musculoskeletal disorders. Veterinary Spinal Manipulation Therapy can often eliminate the source of acute or chronic pain syndromes. Chiropractors define a VSC (referred to as a “subluxation”) as the functional misalignment of a vertebra or the limited mobility of its facet joints. If a subluxation exists, the animal loses normal flexibility of its spine, affecting performance and resulting in stiffness and muscular tension. Illustration of a VSC. The spinal cord is the “information highway” allowing the transmission of information between the brain, muscles, skin and all organs. Reduced mobility between two vertebrae can affect the nerves that leave the spinal cord between these adjacent vertebrae. Every movement, from a slight twitch of the tail to the complicated piaffe in dressage is made possible by synchronizing many muscles. If the function of the nerve fibers, which innervate these muscles, is altered, coordination deteriorates. Small disturbances are usually only caused by a slight interference; however, they can keep the animal from performing at its best in daily routine as well as in demanding exercises. Missteps resulting from lack of coordination may cause injury to other joints and tendons or ligaments in the legs. An animal with a subluxation will change its posture to compensate for the restricted mobility of its spine and to avoid pain. This triggers increased mechanical strain on other parts of the spine and extremity joints, causing secondary restrictions and deterioration of the condition. Nerves branch off from the spinal cord and leave the spinal canal in pairs. As the central nervous system monitors and controls all organ and tissue function, the transmission of information to and from it must flow freely to allow proper function. As a complementary treatment for chronic lameness such as bone spavin, navicular syndrome or tendon problems in the horse as well as arthrosis, spondylosis or tendon problems like cruciate ligament in the dog. Animals with VSCs may present with many symptoms, the most common of which is pain. Animals with back pain often express this in their posture or in their refusal to work. The animals attempts to compensate for the pain by changing its posture and way of going can result in other problems such as joint changes. Subluxations in the spine can affect muscle coordination and mobility of the dog, thereby causing decreased performance. Undefined lameness. This can be caused by VSCs in the joints of limbs or the spine. Incontinence. This can be exacerbated by VSCs in the lumbar vertebrae. Qualified chiropractors are trained to recognize and treat subluxations. However, riders, horse trainers and owners can monitor whether or not their animals have spinal problems. Dog handlers, trainers or owners can look for signs of VSC in their pets. Inspecting the spine before purchasing is just as important as inspecting the legs. 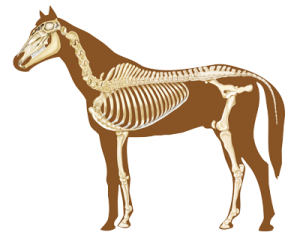 The proper functioning of the back and neck is an important basis for maintaining the animal’s performance. For this reason, PREVENTATIVE health care should be high on the agenda of any owner. When selecting your animal for a particular discipline, you should always pay attention to their build. Many breeds have been selectively bred for years to achieve certain goals and are therefore suitable for particular disciplines such as dressage, jumping or western riding in the horse, or agility, hunting or gundog-work in the dog. Regular massage, balanced foot/hoove care, proper conditioning training and well-fitting equipment are also very important. Gentle training aid methods should be used to avoid jerking and pulling on the animal’s spine. Confinement to a stall or kennel can adversely affect an animal’s condition. Regular exercise is invaluable to promote normal neurologic input, therefore, animals should be permitted to exercise freely as much as possible.